Word of the Day Wednesday: Foliage! As summer comes to end in Boston, many people begin to dread the coming winter – the snow, the winds, and the bitter cold. But don’t let the cooling temperatures and early sunsets get you down; autumn, or fall, is a wonderful season to be in New England! One of the best parts of September and October is looking at the beautiful fall foliage, or leaves. Tree leaves are green during the warmer months because a chemical called chlorophyll helps them turn sunlight into fuel, a process called photosynthesis. In the winter there is not enough sunlight or water for photosynthesis, and the shortening days of autumn are a signal for the leaf to stop making food. The green chlorophyll disappears from the leaf, revealing bright yellow, red, and even purple colors. Looking at the fall foliage, or “leaf peeping”, is a popular New England activity. You can even book vacation and hotel packages to the countryside to look at the changing leaves. Many tourists travel to Maine, New Hampshire, and Vermont to escape the cities and take in the wonder of nature. 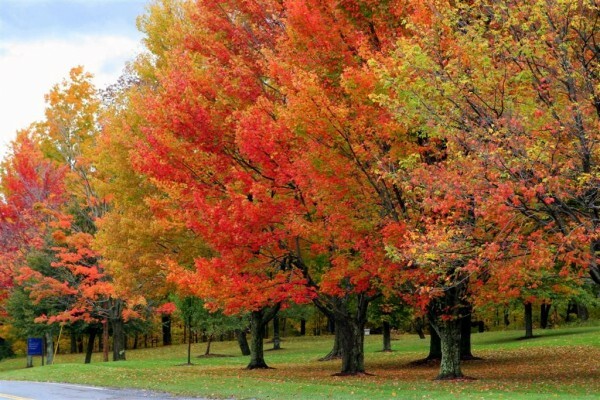 But don’t forget to look around at the trees right here in Boston – you may see some marvelous colors that can help combat the approaching winter blues!